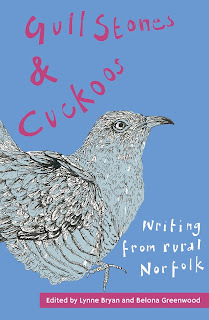 An anthology of compelling and passionate stories, Gull Stones and Cuckoos is to be launched in three rural libraries in Norfolk this October; celebrating the results of a unique creative opportunity for women living in isolated rural communities. 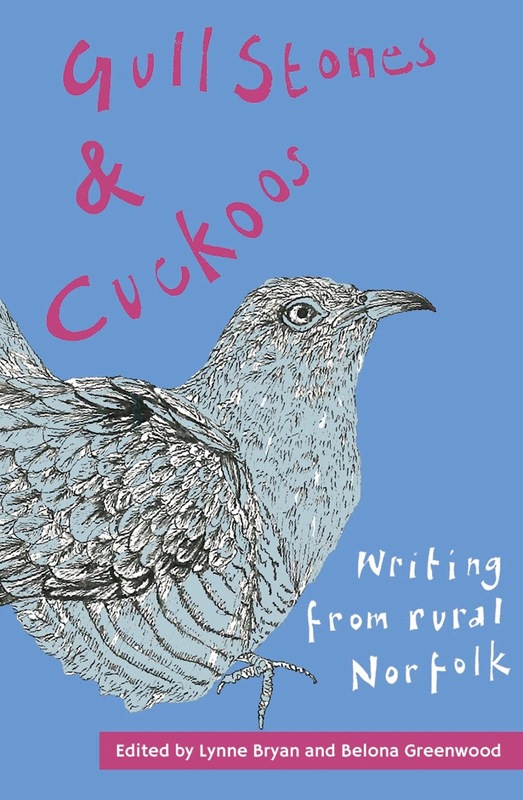 The anthology has grown out of Rural Writes, a partnership between Norfolk Library and Information Service and Words and Women supported by Arts Council England. 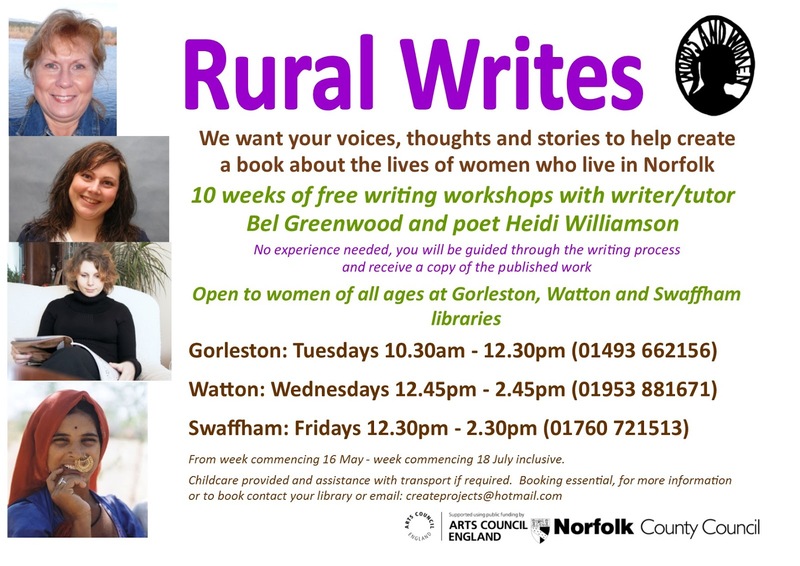 Women of all ages and backgrounds from Gorleston, Watton and Swaffham were invited to attend 10 weeks of life-writing sessions in their local libraries led by two professional writers, Belona Greenwood, co-organiser of Words and Women, and award-winning poet Heidi Williamson. The project was coordinated by Anna Brett of Create Projects. The result, illustrated by Rose Cowan and edited by Lynne Bryan and Belona Greenwood, is a bold, honest and vivid narrative of local lives. Published by Unthank Books, it tells of lost halls, early morning walks, stillness, fairy-light skies, telescopes on allotments, the loneliness of grief and the adventure of new places in rural Norfolk. The writers in this book are new to writing but their stories and observations are compellingly authentic. The collection will be available to borrow from all Norfolk's libraries and to buy from Unthank Books. ‘This project shows how vital libraries are in bringing communities and people together. The women who joined were strangers until they signed up to try their hand at writing. They have made friends, supported and inspired each other. The book itself, is fantastic but the fact the women’s groups are continuing is enormously important and heart-warming,’ said Belona Greenwood of Words and Women. The book launches will take place in Watton Library at 6.00 pm on October 26th, Gorleston Library at 6.30 pm on the 27th and Swaffham Library at 6.30 pm on the 28th. Rural Writes doesn’t end with the book, all three writing groups continue to meet in their local libraries and to post on the Rural Writes blog. Norfolk Library Service, in conjunction with Words & Women, has received an Arts & Libraries Grant from Arts Council East to work with local women in rural communities to create an anthology about their lives. Women of all ages in Watton, Swaffham and living on the Magdalen Estate in Gorleston are invited to get in touch with their local libraries to sign up for 10 weeks of free writing workshops which will encourage women who may not have picked up a pen since school or imagine themselves as able to write, to create a piece of life-writing to include in the book. The workshops, due to start in mid-May, will be led by Belona Greenwood, co-organiser of Words and Women and a winner of the Decibel/Penguin prize for life-writing, and Heidi Williamson, a former Swaffham girl and award-winning poet, whose latest collection of poetry, The Print Museum, has just been launched by Bloodaxe Books. There will be free childcare and some help with transport costs for those wishing to sign up for the project. ‘We are really hoping to encourage women to come along who might not see themselves as writers but have their own story to tell. Women who want to have a go. If anyone is worried, it’s not about spelling or grammar…we can sort all that out; it’s about hearing from women who live in rural communities, about their lives, their relationship with their environment, their hopes, their dreams. It is about what it means to live in the Norfolk countryside today,’ said Belona Greenwood. The workshops will begin with activities to build confidence in writing and to draw out the stories. Then each participant will be encouraged to develop a single piece of work for inclusion in the book which will be illustrated, designed and published by Unthank Books. The book will be available in every library in Norfolk, for sale as print on demand, and given to every participant. Throughout the project there will be help to use digital technology available in the libraries. The project will have a blog and everyone involved will be able to post on it. 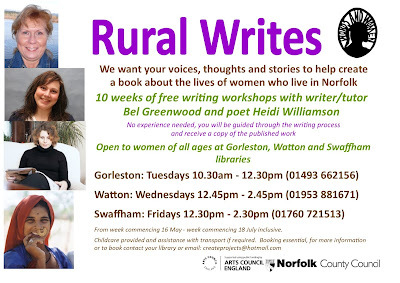 Open to women of all ages at Gorleston, Watton and Swaffham libraries. From 16th May to 18th July inclusive. 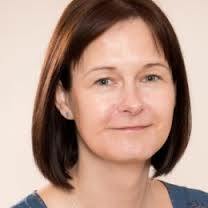 'This is a really good example of the way our libraries, being at the heart of our communities, can bring local people together to work on a project that will have long-lasting value and I would really encourage women in these areas to join the workshops - even if they haven’t picked up a pen or visited a library since they were at school. 'I am particularly keen for older women who grew up in or around Watton, Swaffham or Gorleston to take part, and make sure that their memories of Norfolk in days gone by, when life was so very different, are captured forever. I’m equally interested to see how those memories contrast with the experiences of younger women who have lived in the faster pace of the modern world.